Summary: Reducing maximum advance by modifying the flywheel lump with std fitment Ducati / Kokusan ignition units. A discussion on the Ignitech Sparker TCIP4 unit as I’ve worked it out. Some info duplicated from the report on my 750M. With my 750 Monster I tried something I’d wanted to do for while - find out a bit more about how the ignition timing works. I had been told that the lump on the flywheel defined the full and idle ignition advance  the leading edge giving the full, the trailing edge the idle. This would be rather useful on bikes with high comp pistons, as you could adjust the maximum advance by moving the leading edge of the lump, without changing the idle advance and without having to move the pick ups. To check this I removed the flywheel and filed down the leading edge of the trigger lump, as seen below. The red line is where the lump edge was originally, the blue line where I filed it back to and the yellow line is the trailing edge. The amount I filed off was calculated to be about 5 degrees. This is worked out by measuring the length on the original lump, dividing that by the calculated circumference of the flywheel at the diameter of the lump top (not the flywheel outer diameter, although it’s only a small difference) and then multiplying it by 360 to get a factor for mm of lump per degree. So I refitted the flywheel and checked the timing and the full advance was about 5 degrees back from the full advance mark on the flywheel, whereas previously it had been on the full advance mark. The idle advance had not changed, which was what I expected and hoped would happen. So, this is a simple and easy way of changing the maximum advance. I also found out something I didn’t know here. The Ducati spec for all the 2V carb motors has always been 6 degrees base advance and 32 degrees max advance, meaning the lump on the flywheel corresponds to 26 degrees of rotation. When I was marking out some more advance marks on my original 750 flywheel late in the piece I found the dot corresponding to full advance was at 36 degrees BTDC, not 32. The idle advance dot was still at 6 degrees, as expected. As the 750 and 900 motors with the 2 phase alternator (up to and including ’97 year models) share the same part number flywheel I can only assume all the 750 and 900 actually have 36 degrees maximum advance. I haven’t played with any of the ’98 onward 3 phase alternator flywheels or timing, but the part numbers overlap for the 600 and some 750 motors and some 750 and all 900 motors. So I’m not really sure. I also checked a Ducati Performance aluminium flywheel for the earlier 2 phase alternator bikes and the full advance dot on it was also 36 degrees. On that particular flywheel the idle advance dot was at 6 degrees, as checked against the degree wheel when I was resetting the cam timing. But when I checked the ignition timing with timing light the idle advance was around 3 degrees BTDC. So, on those flywheels, the lump is 33 degrees long it would appear. The position of the leading edge (anti-clockwise end) of the flywheel lump relative to TDC defines the maximum advance. 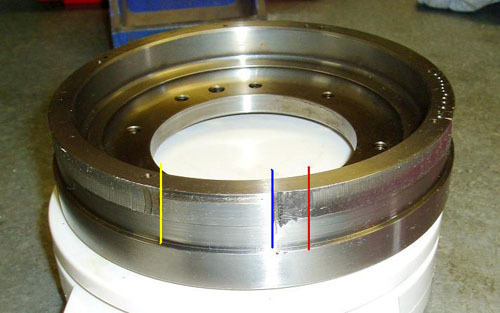 The position of the trailing edge (clockwise end) of the flywheel lump relative to TDC defines the idle advance. 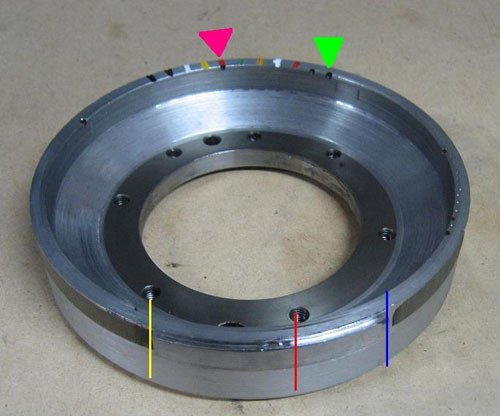 The length of the flywheel lump defines the amount of degrees between idle advance and maximum advance. The positioning of the pick ups gives the actual maximum and idle advance settings. To change or customise the actual maximum and idle advance, you can vary the length of the lump, the position of the lump edges relative to TDC and the pick up position relative to TDC. The Ignitech unit works with very similar limits to the std Kokusan ignition units. It is a plug and play unit, and can have the advance set as desired at any point as allowed by the 10 RPM break points. You do this via a computer, either PC or laptop. The connection on the TCIP4 is a serial port connector, but I have successfully used a generic (and cheap) serial to USB adaptor to hook up to the USB ports on my laptop, which doesn’t have serial ports. The position of the leading edge (anti-clockwise end) of the flywheel lump relative to TDC defines the maximum possible advance. You can use a number bigger than this in the mapping software, but it makes no difference. You can only get the advance defined by the flywheel lump. There is a delay in the TCIP4 that results in the maximum advance being retarded from that defined by the flywheel. In my testing, to maintain a constant advance from 2,000 RPM upwards of less than the maximum possible (say 25 on a 32 degree max advance flywheel), one degree needs to be added for every 1,000 RPM from 4,000 RPM or so upward. So if you want a constant 25 degrees advance up to 9,000 RPM, you have the map set to 25 @ 3,000 RPM, 26 @ 4,000 RPM, 27 @ 5,000 RPM, etc. But, if you are using the maximum advance in the map then you can not eliminate the effect of the delay. If your flywheel and pick up position gives 36 degrees possible maximum advance and your map is at 36 degrees, then by 8,000 RPM the maximum advance in reality is back to 31 degrees. The combination of the position of the trailing edge (clockwise end) of the flywheel lump relative to TDC and the positioning of the pick ups relative to TDC defines the least possible stable advance, which is also the “base advance” and the intended idle advance. By making the lowest RPM breakpoint less than the idle RPM you can get the unit to give less than the idle advance defined by the trailing edge of the lump. The advance is not very stable however, with (in my experience) probably about 6 degrees of scatter, say between 6 degrees BTDC and 12 degrees BTDC when the setting is theoretically 8 or 9 degrees. I found this out as I tried to be tricky and have more advance at cold idle (800 or so RPM) and about 4 degrees less at hot idle (1200 or so RPM) to give better idling when cold. It possibly sort of worked I think, but the std way of doing it (below) works just as well I’d say. Using the trailing edge of the flywheel lump to define the idle advance, and making the lowest RPM breakpoint slightly above idle, results in a very stable and consistant idle advance. The base advance number refers to the number of degrees from the trailing edge (clockwise end) of the flywheel lump to TDC. If your Ducati is all std, this should be 6 or so degrees. This is not a variable of any use, but it can alter your ignition timing when compared to other bikes if it is wrong. Following on from the previous point, remember that the TDC marks on the flywheels are often wrong. Up to a couple of degrees either way. This will mean your base advance may not be accurate and the marks on the flywheel when viewed with a timing light will not be accurate. But again it’s more of a bike to bike comparison thing than an actual problem thing. You can add a TPS (throttle position sensor) to alter part throttle advance. I couldn’t think of how to do it easily with the Mikuni carbs. You can use a MAP (manifold absolute pressure) sensor to mimic a TPS to alter part throttle advance. For the older guys think vacuum advance. The Ignitech manual is very good, so I suggest reading it first. Really. Read it yet? Didn’t think so. Well then, off you go and come back to this when you have. Next is a picture of the Ignitech adjustment software in the “miscellaneous” page. On this page all I have adjusted in use is the rev limiter and TPS voltages. The rev limiter I have varied from 8,500 to 9,000 RPM depending on engine configuration. I don’t think I’ve hit it on the road, but it’s great for dyno runs. It’s not a savage rev limiter, just nice. Some of the greyed text, such as “Excitation long” is adjustable somewhere, but I’ve not bothered. “No connection with PC” simply means the unit isn’t currently hooked up to the PC running the software or hooked up, but not powered. That bit is fairly obvious. When hooked up and running you get live RPM and advance, and TPS voltage if so activated. The second page sets the style of pick up system. You can change the selection via the drop down box (circled in red). The one shown, “classic, 1 lobe (1 or 2 pick-up)”, is the one we need. Check out all the options - this really is a very useful unit. I haven’t used the tacho output as my 750 runs a DP tacho off the coil signal. At the lower left you can see the line “Number of Programing=---“, which tells you how many times you’ve changed maps. It doesn’t take long to hit 100 when you’re playing from my experience. Next is the “Advance” screen, the fun bit. You can see the 10 RPM break points across the screen. They’re all adjustable as required, although I didn’t bother getting too carried away. The advance between two points is simply calculated as a straight line interpolation. For example, 20 degrees at 2,000 RPM and 30 degrees at 3,000 RPM gives 25 degrees at 2,500 RPM. Although you need to remember all these numbers are constrained by the physical limits of the flywheel lump leading edge position and pick up setting and the practical limit of the delay with RPM. At the bottom you can see the “Base Advance” box, which you need to set. I’ll get on to that in a minute. If you want to run a TPS input, or a MAP sensor as TPS mimic, you click the “TPS” box at the bottom left. If you click the “All” box at the bottom it will increase or decrease the advance at all breakpoints using the + and  buttons next to the “All” box. “Programing after change” will reprogram the unit after each change you make. I haven’t used this, but it’s probably a good idea. Otherwise you need to remember to program the unit after you’ve made changes for those changes to be effective. I sometimes forget, which leads to “WTF?” moments when you pick up the timing light and it’s no different. If you want to check the accuracy of the marks on your flywheel then do so first. Although you can’t actually remark the TDC without pulling the alternator cover off, you can get an idea fairly easily and accurately and keep that in mind when pointing the timing light at the flywheel later. Or you could put a dot on the clear window I guess. If you do set up a degree wheel then check the full advance mark on the flywheel too  then you’ll know exactly where it is and how much advance your flywheel lump gives. Once you have your TDC marks settled (or if you skipped the above bit and just want to run with the original ones) run the bike with the original Ducati  Kokusan ignition units fitted. Use the timing light to check the timing at idle and around 3,000  4,000 RPM, when the advance has settled at the maximum. As the flywheels only have TDC, 6 BTDC and 32 (600) or 36 (750, 900) BTDC dots you may need to guess a little here if the timing light shows the timing not lining up with the flywheel dots, but it should be fairly easy. This will give you the idle and full advance for your bike, which (going back to the above points) with the original Ducati  Kokusan units is defined by the leading and trailing edges of the flywheel lump and pick up positioning. The idle advance is the number you need for the “Base Advance” on the TCIP4 set up. Following is for factory spec pick up positioning. If your bike is a 600 the marks should be at 6 degrees and 32 degrees. If it’s a 750 or 900 the marks should be at 6 degrees and 36 degrees. ’00 and ’01 model 600 and 750 use the same flywheel, but I don’t know what the actual timing is on them. You can also set the base advance by checking the maximum advance for varying base advance. I loaded a map that had the maximum advance from 3,000 RPM. Then I set the base advance high  around 15 or so, and with the timing light checked the maximum advance. I then reduced the base advance 1 degree at a time and checked the maximum advance again. As you reduce the base advance the maximum advance will increase until the base advance number matches the actual base advance. From that point, the maximum advance will not change if you continue to decrease the base advance. So that’s another slightly messy way to do it. And you need to keep in mind that revving the engine over 3,000 RPM will induce the delay I talked about earlier, which may influence what timing you see with the timing light. Using the std Ducati / Kokusan units is the easiest way. First runs were done with the modified 750 flywheel, which would have given a maximum of 31 to 32 degrees advance. The points at 800 and 1200 RPM were my attempt at being tricky. The intention was to have more advance at a cold idle, when the idle speed is lower. As the engine warms up and the idle speed increases, the advance would reduce. It sort of worked, but the timing, when viewed with a timing light, was always erratic and varying between say 6 and 12 degrees at a guess. It’s something I may revisit in the future with an extended flywheel lump and retarded pick ups so my base advance will be low and I can reduce the advance at idle and maintain a steady timing. We’ll see. The effects of the delay are shown fairly clearly on the following graph, especially for the lower advance runs. The titles show the colours, with the bike in question being Minnie, the 600M with a 750 engine. Spec was std engine, cam timing @ 114 degree inlet centreline, open air filter, jet kit and Megacycle slip on mufflers. The runs for 34, 37 and 40 degrees are all pretty much the same, as they should be. You can see all the runs end cleanly at 8,500 RPM  where I had the rev limiter set. It works a treat. I’d also raised the rev limiter to 9,000 RPM when the 900 cams went in, so that’s where all the runs stop. Once again, a clear difference with more advance at the top end. Compared to the std pick up positioning, the extra 5 degrees made a difference from 5,500 RPM upwards of a fairly constant 2 to 3 Hp. Although, the effective advance is 31 degrees at 9,000 RPM, which is what my modified flywheel was giving with the std Ducati / Kokusan ignition units. So in this case we weren’t really gaining anything by running the TCIP4. Which is a very valid point, and something that will be missed by some who will fit this unit and not really benefit from it. The TCIP4 is a very nice, well thought out and, for what it offers, amazingly cheap piece of gear. Although, compared to std Ducati / Kokusan ignition units which now retail for something like au$600 each new, the TCIP4 retailing around au$250 is a much needed low cost replacement part in its own right. But where the TCIP4 really comes into its own is when we put something into these motors that they respond to very nicely - compression. Before the TCIP4 you could only retard the pick ups and live with that. Or buy the very expensive Silent Hetnick units that are more “select a pre-mapped option” than adjustable. Now you can set up any curve you like (within the absolute limits) and run it. And that is what makes this unit so cool. It surprised me that an engine with allegedly 11.5 to 12:1 compression could take so much advance, especially at lower RPM, but the 900 cams probably bleed off some lower RPM cylinder pressure and it still only has 31 degrees max at 9,000 RPM. Plus the chambers are fairly small. The graph below shows the 5 sets of runs, starting with HC1, then HC1P3, HC1P6, HC1P9 and ending with HC1P12. Again, as for every other set of runs I’d done previously for std compression combinations, it liked as much advance as I could give it. Then I fitted my extended lump flywheel. It’s shown below. First photo shows where the lump started originally in red and where it now starts now in blue. I did also machine this flywheel down a bit before it went back in  it’s now about 1400 grams, down from 1870. Which is 440 grams or 1 pound for our Imperial friends. This is also when I realised the 750 and 900 flywheels were 6 and 36 degrees. You can see the TDC dot shown by the green arrow, then going anti clockwise around there’s the 6 degree BTDC “idle” dot, then my red 12 degree mark, white 18 degree mark, orange 24 degree mark, green 30 degree mark and the initially rather confusing red arrowed 36 degree dot. This is the original “full advance” dot on the flywheel. The black, furthermost anticlockwise dot is at 60 degrees BTDC. Marking the flywheel out like this also helps when you’re trying to work out what the hell is going on, as I did with the Ignitech unit when I first got it. I also marked out my 600 flywheel (the much lighter, stamped steel dish type) as shown in the photo below. You can see the full advance stamped dot is just past the green 30 degree BTDC mark, which is correct for this 6 + 26 = 32 degrees flywheel. Oddly enough, with my extended lump flywheel and std Ducati / Kokusan boxes the engine would idle happily, but not rev at all. 60 plus degrees of advance must have been a bit too much for it to run. I went back to the dyno with this flywheel fitted to see if I could find a “too much advance” point. I did. I ran a base map named 060308 with effective timing as shown below, with extremes tested being minus 6 (M6) and plus 9 degrees (P9). I had also changed my lower RPM points by this time, idling on the base advance setting of 10 degrees. These runs we done with the std mufflers fitted, which is how I ride the bike normally. These cost about 3 hp at the peak and 8 at 5,000 RPM, so have quite an impact. The next graph shows power versus road speed, as the RPM based curve had some discontinuities at higher RPM. 130km/h is 7,000 RPM. Things that stand out are that 26 degrees advance at 5,000 and over 7,000 RPM was too little (green curve) and that 40 or more degrees over 5,500 RPM is too much. The P9 run is the only time I’ve heard this bike ping, so at least I know it will protest with too much timing. Overall it was happiest with around 32 degrees from 4,000 or so RPM upward, which I guess again brings us back to the std boxes to some extent. Although with std Ducati / Kokusan units the fact you’d have 32 degrees from 2,500 RPM generally leads to pinging and rough running at lower revs. So again it might sound like the TCIP4 doesn’t offer that much benefit, but the fact you can have a progressive curve under 4,000 RPM means you can smooth the off idle response quite a bit. Another thing I noticed was that the choke became much more useful, in that you could move the lever a little and the RPM would change a little, instead of the lots or none you get with the std single Ducati / Kokusan advance step around 2,000 RPM. That’s about all the extra info I can think of for the TCIP4. I know people are fitting them to bevel drive Ducati models and even Laverda triples, where the simple and adaptable nature of the TCIP4 is a god send. Anyone who’s had to play with early Laverda triples that simply don’t start will understand that. If you look at the models listed on the drop down box on “Bike” page in the TCIP4 software you’ll see just how wide the application list is, so I imagine just about any old shitter could run it. It really is a great little box, I can’t say that enough.